In a small village, two children (a badger and a pig) are playing samurai and peasant. The badger is pretending to be a samurai, bullying the pig who is the peasant by making him clear all the stones in his path. Miyamoto Usagi witnesses this and intercedes. He explains that no true samurai is so arrogant and decides to tell the children a story. In his younger days, having just finished his training with a master swordsman, Usagi went about looking for people to challenge. While walking along a riverbank, he spotted what he thought to be an old, fat priest in a robe and straw hat, fishing. He decided to have a little fun with him and, taking his bow and arrow, threatened to pin the priest against a tree unless he carried him across the river on his shoulders so his feet wouldn’t get wet. The priest politely complied and carried Usagi across the river, Usagi cracking fat jokes all the way. Halfway across, however, the priest sank beneath the water’s surface and disappeared. Usagi was forced to swim the rest of the way and emerged soaking wet. A few minutes passed and the priest eventually surfaced, removing his robe and hat to reveal that he was Leonardo the Ninja Turtle all along. Usagi remembered their previous encounter and vowed to finish their battle once and for all. The pair fought for hours, their strength and skill evenly matched. Eventually, Usagi spotted an opening and moved in to make the final blow. Unfortunately, he slipped on the muddy riverbank and fell flat on his back. Rather than strike him down, Leo extended a hand in friendship and complimented him on his swordsmanship. Usagi then tells the children that he and Leonardo became good friends after that and proceeded to have many more adventures together. The point of the story, he spells out, is that you should treat everyone you meet with respect so as to make allies rather than enemies. The children take the lesson to heart and decide to play more fairly together, though the pig insists on pretending to be Leonardo. *Usagi last met Leonardo in “Turtle Soup and Rabbit Stew”. They will meet again in “The Treaty”. *This issue establishes that, so far as Usagi’s chronology is concerned, his first two encounters with Leonardo happened in his early years. *This issue also contained an unrelated Usagi Yojimbo story by Stan Sakai, “Blade of the Gods”. 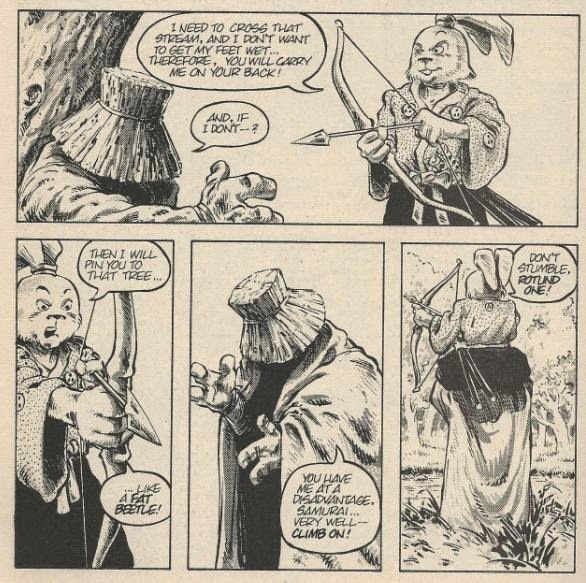 *Oddly, this story has never been reprinted in an Usagi Yojimbo graphic novel collection. 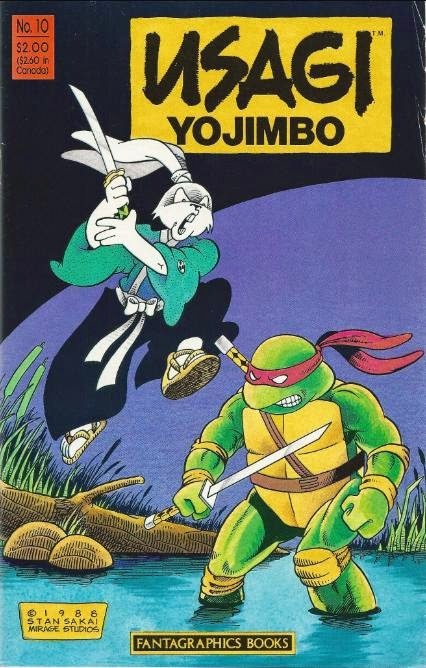 While "Usagi Yojimbo Book 3: Wanderer's Road" reprints Usagi Yojimbo #10, it does not include "The Crossing" (it does, however, include "Turtle Soup and Rabbit Stew"). 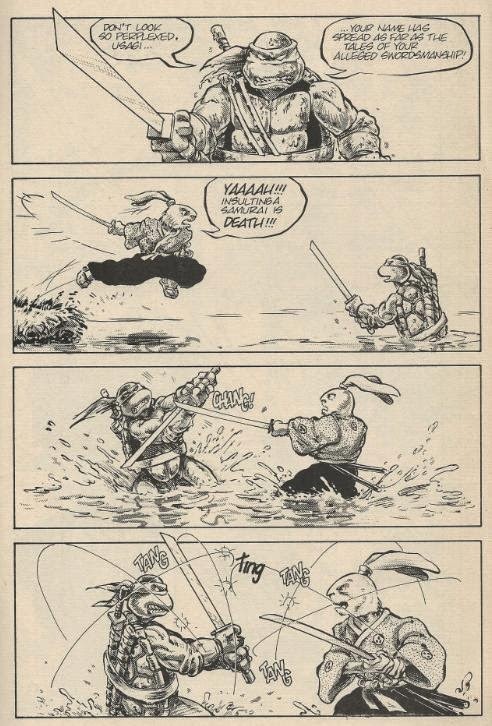 Later, the Fantagraphics hardcover collection, Usagi Yojimbo Special Edition, also skipped over this story while still including "Turtle Soup and Rabbit Stew" and "The Treaty". Precisely why this story is consistently excluded from Usagi collections is unknown, though the likeliest reason is due to it being written and drawn by Peter Laird rather than Stan Sakai. 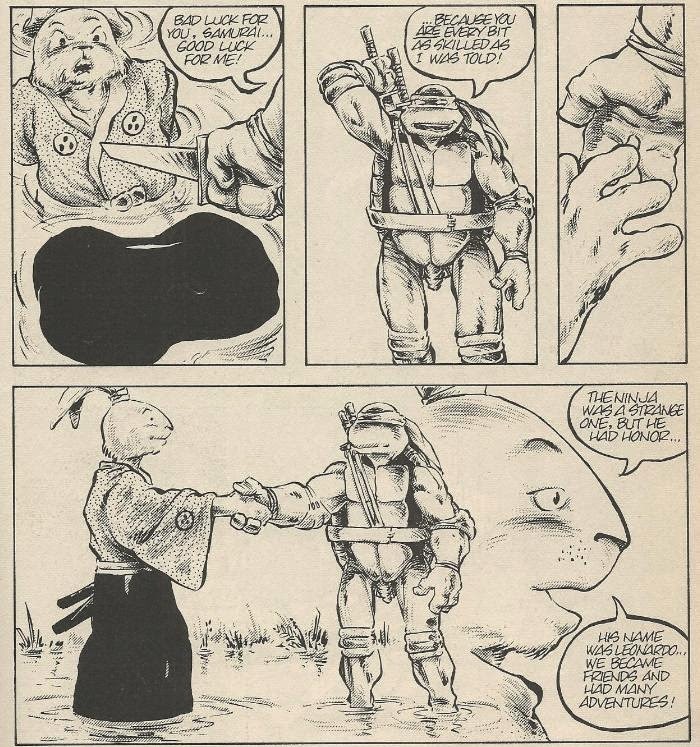 The six TMNT/Usagi Yojimbo crossovers can be easily bisected into two halves: three guest strips and then the three-part “Shades of Green” story arc. Of the first three guest strips, this one is my absolute favorite. Odd that it’s my favorite, too, as I actually prefer Sakai’s art to Laird’s, but I just enjoy this tale of how Usagi and Leo became friends over the other more comedy relief adventures written by Sakai. Leo and Usagi certainly are two “kindred spirits”, and while these crossovers never got a whole lot of time for them to really interact and develop their friendship like the 4Kids cartoon series did, it was still fun to see them getting along rather than going at each other’s throats. The next crossover, “The Treaty”, is a great extension of that. Laird’s style, though grittier and more detailed, actually meshes pretty well with Sakai’s universe of talking Japanese animals. His Usagi’s a little meaner looking than he ought to be, but otherwise fine. Their fight scene is full of dynamic poses and all, but just not enough actual sword-clashing for my money’s worth. Anyhow, not much else to say. “The Crossing” is that vital little chapter in the TMNT/Usagi crossovers, establishing their friendship that’d run off into other Turtles franchises. Being the one installment drawn by Peter Laird also helps it stand out amongst the other chapters, which are all drawn by Sakai.